In the world of swimming, Masters status is achieved at the age of 18. I swam my first Masters meet when I was 23. In the world of running, Masters status is achieved at the age of 40. Guess what? I am 40. It turns out that being a 40 year old female runner is quite useful. Last November, Darren De Reuck, a Masters runner and renowned coach, started recruiting me to run cross country nationals. He wanted me to run on a team as part of his club, the Running Republic of Boulder. At first I laughed heartily at his request. I have never run a cross country race. I am generally not a team person. At 8K, the distance is much too short. The excuses kept flowing. After some consideration and several solid speed workouts, I decided that it would be a fun and unique experience and I would be crazy to pass it up. The team concept really intrigued me since triathlon is such an individual sport. Even when I competed at the Olympics and in World Championships, my performance never directly affected the United States as a team (now the ITU holds a relay championship, but I am long past competing in such an event). As an added bonus, the race is in San Diego, a mere 15 minutes from my parents. I am very familiar with the course having run in the area on numerous occasions. I was urged to purchase a pair of spikes for the occasion. Having never worn a pair, I had no idea what to expect. They are very narrow and outrageously colored. I am wondering how to repurpose them for casual wear. The next topic for discussion has been the spikes themselves. I was under the impression they come in one length. How silly of me; there are multiple lengths for varying conditions: dry grass, wet grass, thick grass, mud, dirt, hot coals. You can even use blanks if there will be an abundance of pavement. I never even knew this could be a problem since it is cross country and not a road race. I have been duly warned that my calves will be extremely sore for several days from wearing the spikes, especially since I have never worn them before and I have not had an ample opportunity to practice with them. The grass in Boulder this time of year, when it is not covered by snow, is very hard and craggy. The grass on the race course will be supple and manicured, somewhat like a golf course. 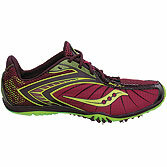 My theory is that since I am a forefoot runner anyway, the extra load from the spikes will be minimal. I hope this is the case since I am running a half marathon eight days later. Wish me luck; I’ll need it so I don’t take a spike in the shin. JZ, you want a good spike grazing incident, that way you have a good scar from your cross country days (or day). Use your elbows on the start, and don't apologize if you step on someone…ladies races are hilarious to watch… "excuse me, sorry"
Crush it from the gun! X-country and trail races are a blast – you're going to love it. It's great that you're familiar w/the course as that'll allow you to better adapt your typical run strategy to the x-country course. Have fun and a great race! Wow, that is great! I am very excited for you. I hope you have a fun filled race! Fast at Forty © 2019. All Rights Reserved.